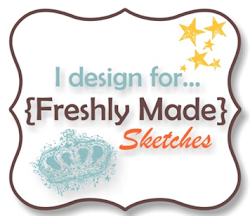 It’s Wednesday, so that means a new sketch at Freshly Made Sketches. Our sketch designer this week is wonderfully talented and creator of gorgeous clean cards – Jennifer Timko. I’m currently on holidays, and even though I thought I packed half of my craft room, it wasn’t until I sat down to make this card that I realised just how much I left at home….. This card took me a little longer to create as I kept ducking outside to enjoy the sunshine on our newly renovated deck at our beach house. I’ve got a couple of Christmas cards coming up soon, so I decided to create a flowery birthday card for this weeks challenge. 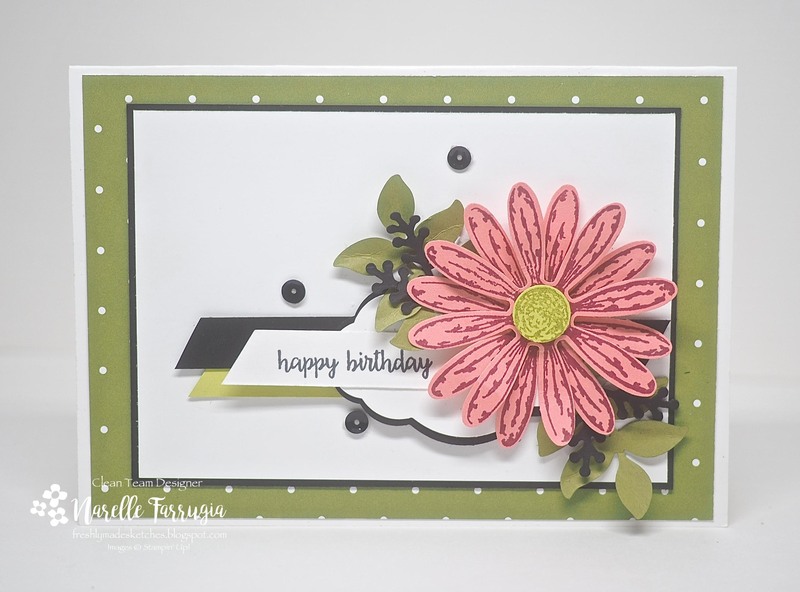 I stamped the daisy from Daisy Delight in Berry Burst on to Sweet Sugarplum card stock. The centre of my daisy was stamped with Old Olive Ink on to Lemon Lime Twist cardstock. The designer series paper I’ve used in the background is from Merry Little Christmas Designer Series Paper – as I was originally going to go with a Christmas card for this challenge. I love that these Christmas papers are versatile and can be used for other cards. The leaves and little black stems I’ve created are cut my Eclectic Layers Thinlits Dies and my sentiment is from Happy Birthday Gorgeous. The team have created gorgeous cards to inspire you, so head over to Freshly Made Sketches and take a look. We would love it if you could join us in this challenge. Beautiful card. Love that daisy. Beautiful bloom with the green and black! I love that DSP too! What a gorgeous card Narelle! Love that big, happy flower! Looks great with the green! You make the most lovely cards!!! Gorgeous pink flower and such pretty foliage around it! Beautiful card, Narelle! Beatutiful card with your limited supplies. 🙂 The colors are gorgeous! Beautiful card, I love the pretty flower.